The World Academy of Arts, Literature, and Media - WAALM supports, develops, and promotes the dramatic and fine arts, music, creative writing and poetry, as well as professional journalism and media productions. WAALM regularly identifies and rewards excellence, and benefits the public, by means of awarding events through which the public gets the opportunity to learn more about cross-cultural activates through media. 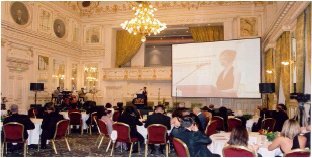 As a nonprofit, independent and secular organisation, WAALM stands for Cultural Diplomacy, it promotes Cross-cultural activities, conferences and Humanitarian efforts. Attending WAALM Awards is by invitation ONLY and audition of the awarding event has no entry fee. However, the non-awarding guests may be required to pay for their own post event reception (food and beverages) if they wish to participate.